A substance that helps a chemical reaction to occur is a catalyst, and the special molecules that catalyze biochemical reactions are called enzymes. Almost all enzymes are proteins, made up of chains of amino acids, and they perform the critical task of lowering the amount of energy needed for the chemical reaction to take place inside the cell. Enzymes do this by binding to the reactant molecules, and holding them in such a way as to make the chemical bond-breaking and bond-forming processes take place more readily. The chemical reactants to which an enzyme binds are the enzyme’s substrates. There may be one or more substrates, depending on the particular chemical reaction. In some reactions, a single-reactant substrate is broken down into multiple products. In others, two substrates may come together to create one larger molecule. Two reactants might also enter a reaction, both become modified, and leave the reaction as two products. The location within the enzyme where the substrate binds is called the enzyme’s active site. The active site is where the “action” happens, so to speak. Since enzymes are proteins, there is a unique combination of amino acids in the enzyme's active site. The unique combination of amino acid, their positions, sequences, structures, and properties, creates a very specific chemical environment within the active site. This specific environment is suited to bind to a specific chemical substrate (or substrates). Due to this jigsaw puzzle-like match between an enzyme and its substrates, enzymes are known for their specificity. The “best fit” results from the shape and the attraction to the substrate of the amino acids in the active site . There is a specifically matched enzyme for each substrate and, thus, for each chemical reaction. 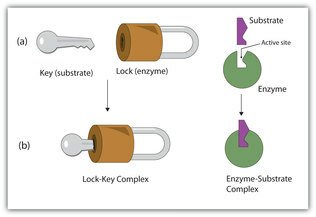 Each enzyme will work with only one type of substrate. This is called the "lock and key" hypothesis. The fact that active sites are so perfectly suited to provide specific environmental conditions also means that they are subject to influences by the local environment. This means that changing the local pH or temperature can change the nature of the active site, changing how it is attracted to the substrate. Increasing or decreasing the temperature outside of an optimal range can affect chemical bonds within the active site in such a way that they are less well suited to bind substrates. High temperatures will eventually cause enzymes, like other biological molecules, to denature, a process that changes the natural properties of a substance. Likewise, the pH of the local environment can also affect enzyme function. Active site amino acid residues have their own acidic or basic properties that are optimal for catalysis. These residues are sensitive to changes in pH that can impair the way substrate molecules bind. Enzymes are suited to function best within a certain pH range, and, as with temperature, extreme pH values (acidic or basic) of the environment can cause enzymes to denature. This text is adapted under a Creative Commons 4.0 license. You can find the original source here. This video is of a teacher explaining a similar experiment to his class. He doesn't have the oxygen sensors that we have so his class need a different way to measure the amount of oxygen released from the reaction. He uses soap to trap the oxygen in bubbles and then he can measure the height of the bubbles to make a guess as to the amount of oxygen released. Higher bubbles would mean more oxygen gas. This video explains how temperature and pH affect the rate of the reaction. It discusses how enzymes work and how the temperature or pH can affect the function of the enzymes. Remember, we are using yeast at different temperatures in order to test the affect of temperature on the enzyme activity. We are not testing pH but it might be good additional information that will inform your understanding of how enzymes work. Sign up for groups on canvas. See this link for how to join a group. You will fill out the lab guide during class and if you do not finish it will be homework. This will be submitted to canvas, one per group. See below for things you should consider and questions you should be able to answer before the start of the lab. Make sure you answer these questions to yourself before the lab. 3. Submit the google doc of the lab guide to canvas. 4. Make a copy of the data tables. Data tables can be found here. They are already set up to graph your data and find averages. If you want to learn how to do this on your own you should arrange a time to see me in SAS. I will be able to spend some time teaching this in class but most of you will want to use that time to work on your conclusions. Please make sure you understand the lab and all the steps before starting the lab. It might be helpful to flow chart the procedure so you are sure of what you are going to do. Collect the data during this step. 6. Turn in the data. Data is due at the end of class. Submit one copy to canvas per group. 7. Write your conclusion and abstract. Write a conclusion and abstract using the guides found here. This is an individual assignment. Your individual conclusion and abstract will be submitted on one document to Canvas. It is due on Wednesday, March 6th. What is the purpose of the yeast? Why use a stir plate for the yeast? Does it matter if you use a different amount of hydrogen peroxide or yeast than is in the procedure? What is the purpose of the hydrogen peroxide? Why might the starting oxygen level change? What would you expect to happen if you ran the experiment for longer than 300 seconds (5 min)? What is the manipulated variable (what are you changing)? What is the responding variable (what are you measuring? What are the controlled variables (what conditions are you keeping the same with each trial)? Does my experiment test what I want it to test? Have I made sure there are no other factors that might cause variations in my results? Am I testing a range of variables (3+ temperatures, concentrations, etc.)? Could I test more easily? Have I listed all of the materials that I will need along with the quantities and sizes of each thing I need? Will I be able to complete my data collection during a 100 minute class? Are there things I can prepare in advance so that my experiment day goes smoother?